Locations logs' table shows a list of all Locations with a number of customers attached to them and number of online customers. If you click on each number in the Customers' column, the full list of customers associated with that location will show up. If it is a long list of customers and you have to check customers by particular status you can use filter by clicking on a status below the table. It is possible to add a new location here by clicking on Add on the top right of the table. 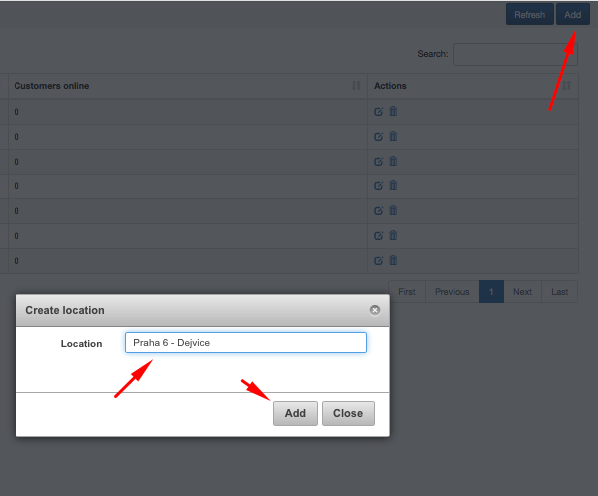 You can also edit Location by clicking on Edit icon in Actions column.